‘Healthy Vending’ machines are easily identified by a RebelWell sticker. The RebelWell ‘blue man’ logo is on a green tab in front of each healthy snack, and nutrition facts are also posted on the machines. OXFORD, Miss. – New resources are available for University of Mississippi faculty, staff and students hoping to keep their New Year’s resolutions to live a healthier lifestyle, thanks to a project carried out by School of Applied Sciences faculty members and RebelWell staff. 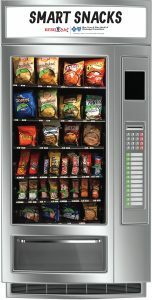 Vending machines, notorious for being stuffed full of candy, chips and cookies, are often the most convenient place for hungry students and university employees to grab a snack or meal replacement during a busy day. The USDA reports that more than a quarter of a young person’s daily calories come from snacks, and those who have healthy eating patterns are more likely to perform better academically. 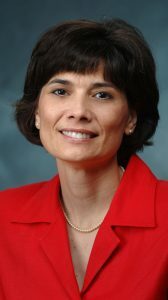 Laurel Lambert, associate professor of nutrition and hospitality management, or NHM, explained that most convenience snacks found in vending machines are not healthy options. After conducting an assessment of public access snacks on the Ole Miss campus, she discovered that less than 2 percent of the items available met USDA “Smart Snack” guidelines that require snacks to limit total calories, types of fat, sodium and sugar. “A snack choice can be considered unhealthy if it has high energy density – or a lot of calories in a little food – has poor or low nutrients, is high in sugar and/or fat, or low in fiber,” Lambert said. Through a collaborative effort with RebelWell, a campus and community wellness program, faculty in the Department of Nutrition and Hospitality Management sought to improve healthy vending options on campus and make them more visible to consumers. “We are now providing low-sodium, reduced-fat, reduced-sugar and high-fiber options that meet American Heart Association healthy snacking guidelines in vending machines across campus,” Lambert said. Each ‘Healthy Vending’ machine is easily identified by a RebelWell sticker. The RebelWell “blue man” logo is placed on a green tab in front of the healthy snack. Nutrition facts are also posted on the machines. The official online campus map has healthy vending options listed by location under “Food and Shopping” in “Services.” The “Healthy Vending” offerings are available in half the public vending machines in addition to select residence halls. 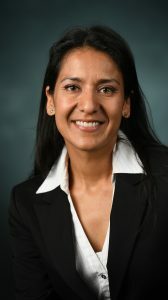 RebelWell’s goal is to create a healthy environment that promotes healthy food choices – a goal that complements the School of Applied Sciences’ mission to improve human health and well-being through teaching, research and service, said Mariana Jurss, a registered dietitian for the organization. “We were aware of Dr. Lambert’s research and interest in healthy vending options, and we thought this would be a great project to pursue,” Jurss said. Sales of healthy snacks have gradually increased over the past 12 months to equal sales of conventional snacks, making it a sustainable, healthy option on campus, Jurss said. Beyond their collaboration to improve the food environment on campus, RebelWell and NHM recently spent time in the community promoting healthy cooking at home. Jurss led Lambert’s NHM 613: Nutrition Education class in conducting a food demo for community members involved with Good Food for Oxford Schools. LaReine Schock, a second-year graduate student in food and nutrition services from Wichita, Kansas, helped teach 60 participants how to cook affordable meals for their family at the event. Participation in food demos has yielded a positive response on campus and in the community, Jurss said. NHM faculty take pride in contributing to research that benefits Ole Miss students. Beyond the vending machine study, Lambert and David Joung, assistant professor of nutrition and hospitality management, conducted an evaluation of students’ satisfaction with three all-you-can-eat university dining facilities. The study, which was published in the Journal of Foodservice Business Research in June 2018, helped inform Campus Dining about patrons’ experiences so they could make better decisions about areas in need of improvement. The School of Applied Sciences offers professional preparation programs that integrate academic study, clinical training, creative research, service-learning and community outreach, leading to the development of leaders whose professional endeavors will improve health and well-being. The school’s vision is for academic excellence – that each department will be recognized by their respective scientific, professional and community organizations as a hub for scholarly thought, professional development and community impact. For more information about degree programs available in nutrition and hospitality management, visit http://nhm.olemiss.edu/. For more information about RebelWell and its upcoming community events, visit https://rebelwell.olemiss.edu/.